WHY: New Work is supposed to change everything. Leadership seems to be facing completely new challenges. We experience that there is insecurity in executive search and selection, management development and career planning about which success factors from the past (may) still apply in the future and where new approaches are necessary. Often, managers ask themselves whether they are fit for the future. WHAT: We invite you to an exciting JAM SESSION with plenty of room for exchanging and discussing experiences and open-ended questions. We focus on what we can learn from the past and how leadership can be successful and authentic in the future. SPEAKER: We are excited that great experts in their field will provide us with key-notes and real live case studies on how they are addressing the above-mentioned challenges. E.g. a CEO from the financial industry, two winners of HR awards in 2018, and a well-known social-media influencer. Step by step they will be announced here. It is worth visiting this event page regularly. SPECIAL GUEST: Among others, you have the chance to see Dr. Robert Hogan, and Scott Gregory live at the JAM SESSION. 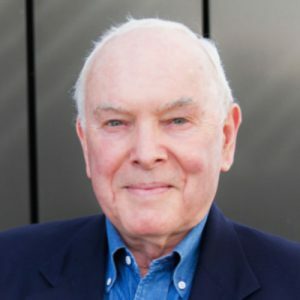 Robert is the founder of Hogan Assessment Systems, and was the first to empirically show, that personality can be measured and behavior and performance in the workplace can be predicted on its basis. Scott is the CEO at Hogan Assessments has decades of experiences working as a (Hogan) consultant in the industry. PARTICIPANTS: All customers and partners of Odgers Berndtson and/or RELEVANT as well as interested individuals are invited to join. The Number of participants is limited. Therefore, please register quickly to secure your ticket. HOSTS: The event is jointly hosted by Odgers Berndtson and RELEVANT. We are excited to expand our collaboration, including the global CEOxOneDay initiative. We share a truly international approach, a passion for evidence-based assessments as well as hold ourselves accountable for providing solutions to our clients, which fit their (future) realities best. We look forward meeting you in Frankfurt. We want the event to provide you with relevant input for your daily work. Soon we will provide a survey for you here. We would be pleased to receive your registration via the following registration form. Please note that we reserve the right to make program changes. The general terms and conditions of RELEVANT apply. We are planning to document the event through photo and video recordings for our website as well as our social media channels. The photos and videos can also be found by search engines. Important information: Of course your consent is voluntary and you can withdraw it at any time with future effect informally by e-mail to kontakt@relevant-mb.de or by conventional mail in whole or in part. It will only be used for this purpose. In the event of withdrawal, we will immediately remove your photos and name from our website. If we have also used video material of you, we will continue to use it. If there should be a new edition of the video, we will of course then use film material which does not show you. We look forward to your participation. Please fill in the following form for a binding registration. Declaration of consent. Please click on the boxes whose contents you agree to. Thank you very much! Yes, I agree that photos of me may be published on the RELEVANT website and social channels. Yes, I agree that RELEVANT may use my film recordings in videos on the internet or other media (e.g. DVD). This also includes the provision in video portals such as YouTube.